“You accepted us like family. Here we weren’t the foreigners—the refugees. We were part of the group. Thank you.” When the Church of God is willing to work together to advance the kingdom, people notice. Lives are touched. Hearts are softened. Seeds are planted. History tells us many of these seeds not only germinate, but bear fruit and spread more seeds. This summer, moved by the refugee crisis in our world today, Church of God leaders in Germany committed to invest in six refugees from Afghanistan. Each one separated from family and friends after fleeing dangerous living conditions, these refugee youth with a background in Islam would not only hear the gospel, but feel sincere love and grace from peers who humbly bear the name of Christ. IYC students helped make it all possible. Teenfreizeit. That’s what they call the Church of God youth camp in Germany. 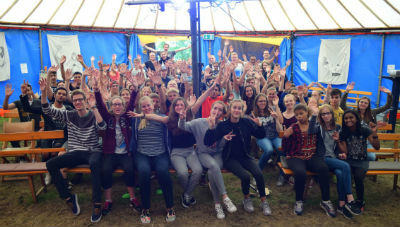 For ten days, about eighty students participated in an experience not unlike church camping in the United States. This year’s theme, “All I Need” spoke to the sufficiency of Christ in multiple areas of life particularly relevant to teens. Imagine such a message penetrating the long-held beliefs and worldviews of students not only looking for hope in the midst of chaos, but those also unfamiliar with the gospel. At first, the refugee youth were a bit shy. But sensing the warmth of the German Christian teens, they soon felt at ease. One refugee reported that he’d been in Germany for a year, and that the ten days at the camp were his best days yet. Through a partnership between the German Church of God and Spread the Word, the camp experiences for these refugees were paid in full. Since IYC2002, more than $800,000 has been raised for Spread the Word. The Church of God initiative directly supports evangelism efforts around the world. Thank you, students, for your faithful giving at the International Youth Convention, state and district camps and conferences, and at your home church. Just a small part of what you’ve given went to sponsor these six Muslim refugees so they could attend a Christian camp and hear about Jesus. “As you know, there is a large influx of refugees here,” Josh Weiger explains, “and the German church is stepping up in some very specific ways to meet the needs of people.” The Global Strategy missionary to Germany continues, “Also the church realizes this is an incredible opportunity to share the hope and good news of the gospel of Jesus. Look for more resources on immigration and the refugee crisis, as a product of this year’s CHOG Tables, coming in 2017. Learn more about Spread the Word at www.chogy.org/spread-the-word. 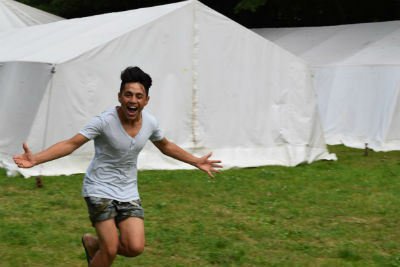 This entry was posted in All Church of God, Global Strategy, IYC: International Youth Convention, Youth Ministries and tagged Afghanistan, camp, crisis, evangelism, Germany, Islam, IYC, Josh Weiger, missions, Muslim, refugee, sponsor, Spread the Word, Teenfreizeit, teens, thank you, underwrite, youth. Bookmark the permalink.